WASHINGTON, DC, December 15, 2010 (ENS) – The U.S. Justice Department today filed suit against BP Exploration and Production Inc. and eight other companies in an effort to recover billions of dollars in damages from the Gulf of Mexico oil spill earlier this year. 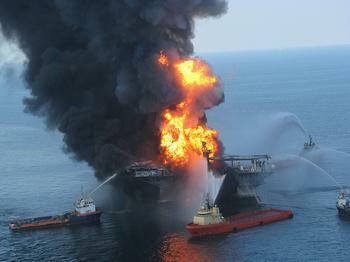 Filed in U.S. District Court in New Orleans, the civil lawsuit seeks damages from BP, Transocean Holdings and Transocean Offshore Deepwater Drilling Inc., Anadarko Petroleum Corp. and Anadarko Exploration & Production LP, Mitsui & Co Ltd.’s MOEX Offshore 2007 LLC, Triton Asset Leasing GMBH, and BP’s insurer Lloyds of London for their actions associated with the largest offshore oil spill in U.S. history. The lawsuit asks that the companies be held liable for unlimited damages, beyond the $75 million cap under the U.S. Oil Pollution Act. The lawsuit also seeks civil penalties under the Clean Water Act. “We intend to prove that these violations caused or contributed to this massive oil spill, and that the defendants are therefore responsible – under the Oil Pollution Act – for government removal costs, economic losses, and environmental damages,” U.S. Attorney General Eric Holder said at a news conference today at Justice Department headquarters in Washington. An explosion at the Deepwater Horizon oil rig leased by BP from Transocean killed 11 workers and injured 17 others last April 20. Oil gushed from BP’s undersea Macondo well amounting to 4.1 million barrels, according to U.S. government data before the well was finally capped on July 19. The well was permanently sealed in September. Oil from the well, located about 50 miles from the Mississippi Delta, polluted the Gulf of Mexico and shorelines from Florida to Texas. Anadarko and MOEX Offshore 2007 LLC were in a partnership with BP for drilling the Macondo well in the Gulf of Mexico.